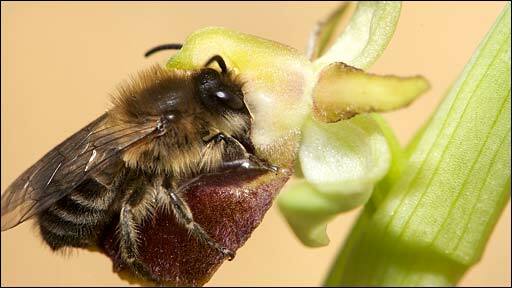 More light has been shed on orchids that trick male bees into pollinating them by mimicking female insects. The bees, lured by a pheromone-packed scent, attempt to mate with the flowers, but unwittingly carry away pollen after their visit. Now, scientists working in the south of France have found how the flowers' false advertising could help new species of orchids to arise. The research is published in the journal BMC Evolutionary Biology. Lead scientist Dr Nicolas Vereecken, from the Free University of Brussels (Universite Libre de Bruxelles), said: "This pollination strategy is only known in orchids. "For flowers to attract insects by imititating the female mating signals instead of advertising nectar or oil or pollen is very peculiar." The floral odour that the flowers produced, he said, was key. 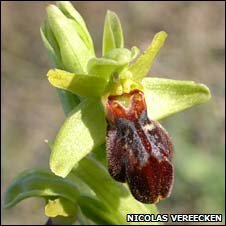 To find out more about the orchid's deceptive methods, a team of researchers from Belgium, Switzerland and Italy looked at two species of orchids that grow in southern France: Ophrys arachnitiformis and Ophrys lupercalis. While both of these species draw in males by acting as female impersonators, they both emit very different scents that attract different species of bees. 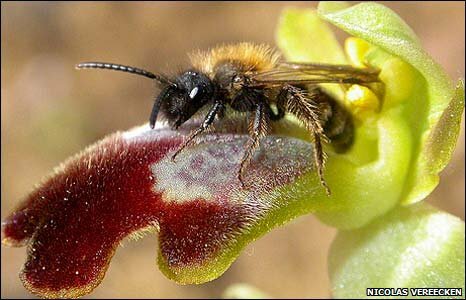 Dr Vereecken said: "Because they usually attract different solitary bee species, and the position of each bee on the orchid is different - for one species, the insect picks up the pollen masses on its head, on the other one, it picks up the pollen masses on its back - there is virtually no chance for cross-pollination to occur." However, the scientists were surprised to find a large population of a hybrid species of orchid growing nearby, created by interbreeding between Ophrys arachnitiformis and Ophrys lupercalis. Video surveillance revealed that the bees, which usually were only lured to one species of orchid, had for some reason been tempted to play the field. Dr Vereecken told BBC News: "We have seen the male of one bee species that usually visits Ophrys arachnitiformis visiting the other orchid. And it picks up one pollen mass on its head and another pollen mass its back. "It shows how fast this reproductive isolation can be broken down in a single visit." After the team looked more closely at the new hybrid orchid, they made another surprising discovery. The scientists had previously thought that any orchid hybrids would produce a female-enticing scent that was mid-way between the aromas that its parent plants produced. But this hybrid was producing a completely different odour, which in turn attracted the sexual advances of a third bee species. This would mean, if the hybrid was not sterile, as this one was, that an entirely new species of orchid had been created. Prior to this discovery, the researchers had thought that new species of orchids came about through gradual mutations, which over time altered the orchids' scent until they attracted new pollinators, preventing any cross-pollination with their un-mutated form. But the unearthing of the hybrid had added another dimension, said Dr Vereecken. He said: "Here we have a drastic change just in one generation. "This study shows virtually all the steps leading to the creation of a new species."